Les Nabis et le décor exhibition at the Musée du Luxembourg, in the Luxemburg Gardens in Paris till the end of June, is set in a very fitting place. The colourful and floral creativity of 19th century works by the so-called 'Prophets' flows almost seamlessly into the public garden itself. Les Nabis were a group of avant-garde post-impressionist French artists, most of them known for the flattened look of their paintings, crammed with detail. They also had no fear of juxtaposing strong colours or playing with shades of one overriding hue applied with a thousand brush stokes. Their work spilled over the edge of painting frames. This exhibition shows how their work was adpated or applied to screens, wallpaper and also to wall panels, tapestries, ceramics or stained-glass windows. In the late nineteenth and early twentieth centuries their patterns were inspired by nature and involved the liberal use of the arabesque for, as the name suggests, decoration as well as ornamentation. 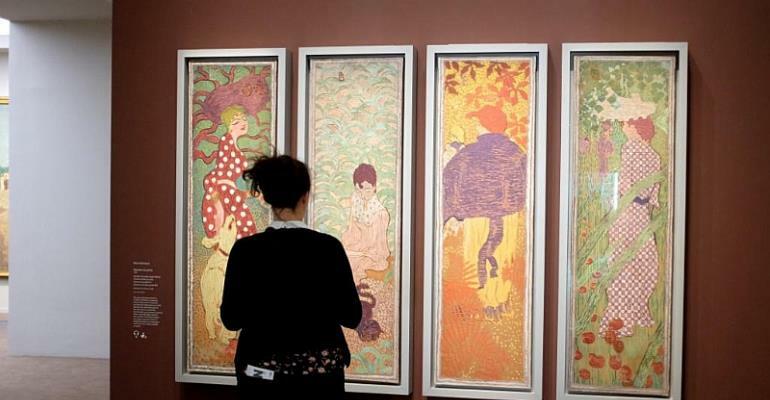 Some of the artists' names may be familiar such as Pierre Bonnard, Edouard Vuillard, Maurice Denis, Paul Serusier and Paul-Elie Ranson. Other members of the group were Vuillard's brother-in-law Ker-Xavier Roussel and the Franco-Swiss Félix Vallotton. None of them has generated the world-wide appeal of their French impressionist cousin, Claude Monet. The artists in this group gave themselves the aim of renewing and liberating artistic expression and vision. Major sources of inspiration for the Nabis were Britain's John Ruskin and William Morris. Contemporary Japanese art was also an inspiration and the exhibition displays works from four Utagawas . . . Kunisada, Kuniyoshi, Sadakage and Yoshimura. The exhibition highlights these applied arts. Les Nabis and le décor, at Musée de Luxembourg in Paris, ends on 30 June 2019.